At your initial consultation your chiropractor will take a detailed case history and any past medical history that may be pertinent. Following this you will undergo a thorough physical examination to assess the source of your complaint and detect any other medical concerns that you may be unaware of. This is achieved by postural and gait analysis, orthopaedic and neurological testing and specific chiropractic tests. If x-rays are deemed necessary these will be taken in accordance with the Royal College of Radiologists guidelines. The initial visit may or may not include a report of findings and treatment as well, depending on time constraints. Either on your initial consultation, or before your first treatment, your doctor will give you an explanation of the findings including a treatment plan, prognosis and any associated risks. Click here to find out what your Second Visit will be like! 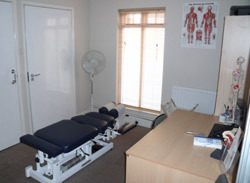 To schedule an appointment, call our Marlow or Twyford clinic today.